If you got stuck in a long line behind Grateful Dead fans at the post office last week, know this: You were not alone. 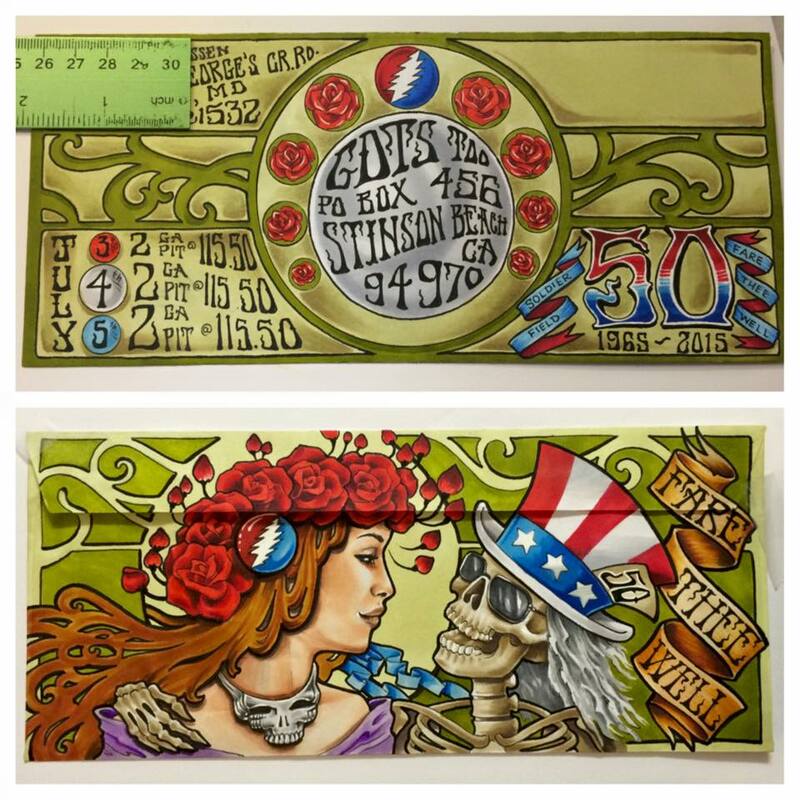 The band said more than 60,000 individual envelopes flooded into the California post office box collecting orders from Deadheads trying to get tickets for the band's reunion shows in Soldier Field this summer. Soldier Field's capacity for football games is 61,500, although more can pack in for concerts. Relix.com reported that the 60,000 fans who mail-ordered for tickets asked for more than 360,000 tickets in total, meaning many fans will be left disappointed and get their postal money orders back. Because of the influx, the Dead canceled all other preorders, leaving just a Feb. 28 Ticketmaster ticket release. As is the custom, the band offered advance tickets sales for fans willing to jump through a series of hoops and send away for tickets. Fans had to pony up money for money orders in all the different combinations of costs associated with the tickets. Then they had to send a self-addressed stamped envelope and a 3-by-5 index card detailing what tickets they wanted. The process led to long lines at post offices around Chicago — and around the country — as fans methodically had postal clerks print out their money orders. As is also the custom, the band encouraged fans to decorate their envelopes, leading to brightly colored submissions. Fans jockey for the fanciest envelopes in hopes of getting better tickets. So be prepared, it appears the deadheads are coming in full force over fourth of July weekend. When Jeremy Davis comes to Chicago this summer for what could be the Grateful Dead's final shows, the Florida man wants to camp in his RV in a parking lot near Soldier Field along with tens of thousands of other "Deadheads" he considers family. That's why Davis on Sunday initiated an online petition asking the powers that be to open up the lots for overnight parking. His idea caught on, and the petition had more than 6,300 signatures as of Thursday afternoon. To us this seems optimistic. It also seems unlikely that the city will go for it. After all, does shakedown street mean anything to any of you? Oh and if this doesn't appeal to your taste in music, don't worry, it was just announced that ANOTHER festival called "Windy City Lake Shake" would be coming to Northerly Island for a 3-day event June 19-21st (think Lollapalooza but for Country fans). Needless to say, if you can't find a concert that you would want to attend this summer near our hood, you probably don't like music.